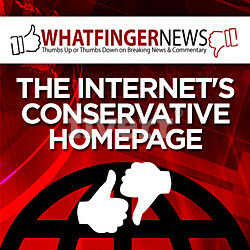 But something funny happened on the way to the headlines. 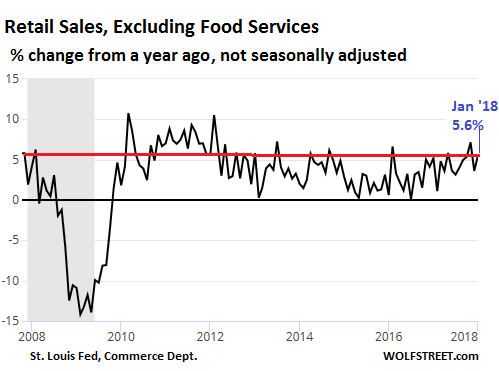 In describing the retail-sales data released today, words like “slumps” and “declines” kept cropping up in the headlines. 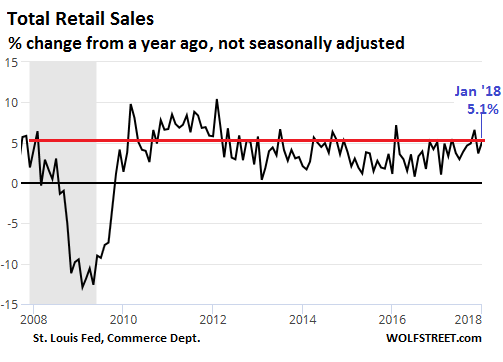 This referred to the seasonally adjusted month-over-month data, so the percentage change from December retail sales (peak holiday selling season) to January retail sales (peak merchandise-return season). This comparison is only possible with gigantic seasonal adjustments that try to smooth away the holiday selling peak and the post-holiday hangover in a way that, hopefully, the index ticks up a bit from December to January. 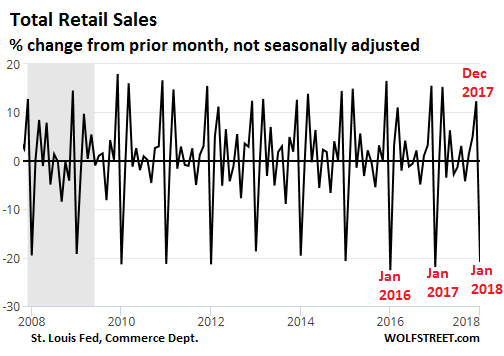 Not seasonally adjusted, total retail sales plunged 21% from December to January, but they plunged between 19% and 23% in prior Januaries. Hence the gigantic seasonal adjustments needed to smoothen out this wildly gyrating seasonal data. So retail sales in January were solid, despite the “slumps” and “declines” in the headlines. Once we get the Q4 ecommerce data, we will likely see that much of the growth came from e-commerce, which is estimated to have surged 18% over the holidays. None of this data is adjusted for inflation. Today, the Bureau of Labor Statistics released its Consumer Price Index. For once, all eyes were riveted on it. If it surprised to the upside, it would add fuel to the rate-hike trajectory of the Fed and the bond market’s reaction to it. If it came in below expectations, it could cool some of this fever. 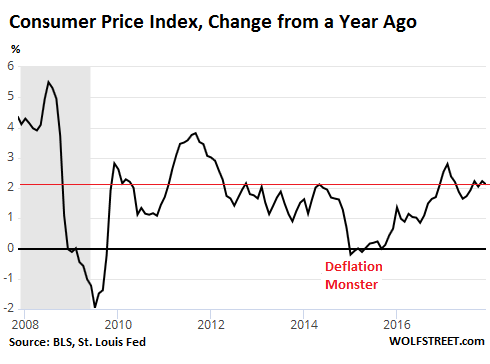 This wasn’t an inflation “shock” or whatever, but it was above expectations. It was enough to convince the Treasury market that the Fed will take inflation seriously, that it will continue on its path to push for higher interest rates in an attempt to tighten the very loose financial conditions. On the news, 10-year Treasuries sold off and the 10-year yield jumped 9 basis points to 2.91% by early afternoon. If it closes at this rate, it would be the highest since January 2014. 30-year Treasuries sold off too, with the 30-year yield jumping 7 basis points to 3.17%.